With the dawn of a New Year, there is no shortage of new rifles hitting firearm-store shelves around the country. Nor is there any shortage of new gun talk in shops, on social media and at shooting ranges. That's especially true now that the 2017 SHOT Show has come and gone, an industry showcase that brought out numerous new rifle offerings from a number of tried-and-true manufacturers. While there are literally dozens of new bolt-action and modern sporting rifles (MSR, AR) available for hunters and shooters to consider, there are a few new rifles that have caught our eye. Built on the shoulders of Browning's most popular X-Bolt rifle ever – the Hell's Canyon Speed model – this new rifle from the iconic American gun maker is sure to please with its composite stock and textured gripping surface. With a Inflex Recoil Pad, a fluted, heavy-sporter-contour barrel that is free-floated, a Cerakote Burnt Bronze finish, an adjustable Feather Trigger, a 60-degree short throw bolt, a detachable rotary magazine, a threaded muzzle brake, and A-TACS AU (Arid/Urban) camo, hunters and bench shooters should love this new rifle from the company that bears John M. Browning's time-honored name. Available in a variety of hard-hitting cartridges including the 6.5 Creedmoor, the 26 and the 28 Nosler, the .270 WSM, the .300 WSM, the 7mm Rem Mag and the .300 Win Mag, this new rifle should offer superior accuracy and performance downrange. For more information about the new Browning X-Bolt Hell’s Canyon Long Range rifle, please click here. 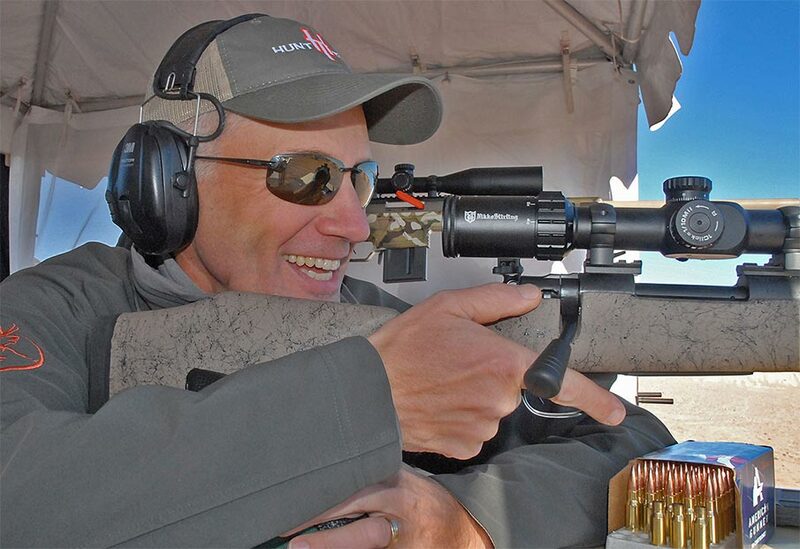 The folks with Howa rifles have plenty of fans, not the least of which is Randy Newberg, host of the Fresh Tracks television program on Sportsman Channel. They'll have even more fans after the introduction of the new Long Range Rifle, chambered in 6.5 Creedmoor and .308 Win. With a 26-inch heavy threaded barrel (with a thread cap protector), a Bell and Carlson varmint-tactical style stock and vented forend; a full-aluminum bedding block; a one-inch Pachmayr Decelerator Recoil Pad; a Nikko Sterling Diamond First Focal Plane (FFP) 4-16x44 scope and two-piece bases and rings; this is a hard hitting, straight shooting performer from Howa. Incidentally, the company also has come out with the Howa KUIU Series, a rifle package that comes chambered a variety of short-action, long-action and magnum cartridges while being offered in KUIU's popular Vias and Verde camo patterns. All in all, another big year for the folks at Howa. For more information about the new Howa Long Range rifle, please click here. As an all-new Patriot model from the folks at Mossberg International, the new Predator rifle sports a Flat Dark Earth color scheme on the stock – which should be a big hit among hunters – along with several attractive features. Those include a LBA adjustable trigger (from 2 to 7 pounds), a 22-inch fluted, threaded barrel, an oversized-bolt handle, spiral-fluted bolt, a top-mount Picatinny rail-scope base and a 4-round box magazine. Add in three popular cartridges – .243 Win., .308 Win. and the 6.5 Creedmoor – and this new Predator rifle offering from Mossberg should be as big a hit as the other Patriot models have been. For more information about the new Mossberg Patriot Predator rifle, please click here. Aimed at serious hunters and target shooters, the new Nosler Model 48 Long Range rifle gives buyers a number of high-end features. Those include a rugged action machined from a solid block of steel, a 26-inch stainless, match-grade Shilen Barrel, glass and aluminum pillar bedding, a Timney Trigger, a Cerakote all-weather finish, a Manners MCS-T Elite Tac carbon-fiber stock and the company's guaranteed MOA Accuracy pledge (with Nosler ammunition). All in all, this looks to be a sure-fire winner in Nosler's outstanding lineup with chamber offerings in the 26 Nosler, 28 Nosler, 30 Nosler, 33 Nosler, .300 Win. Mag. and the ever popular 6.5 Creedmoor. At the end of the day, this rifle should be a hit for hunters chasing whitetail in various places like Texas to big game critters in the plains, foothills and mountains out West. For more information about the new Nosler Model 48 Long Range rifle, please click here. One of the most iconic rifle models of all-time, it's hard to believe the Remington Model 700 can be improved upon. But that's what the engineers at Remington Arms say they have done in the company's 201st year of operation. Billed as the most accurate production rifle ever, the newest model in the 700 series – the Model 700 AWR (American Wilderness Rifle) – should be a big hit with backcountry, do-it-yourself style big game hunters. The Model 700 AWR features a 416-stainless-steel barreled-action with a Cerakote finish, 5R rifling for less fouling and improved accuracy, a 24- or 26-inch free-floated barrel and a X-Mark Pro Externally Adjustable Trigger (which has zero creep and is user adjustable from 3 to 5 pounds). Add in a Supercell Recoil Pad and a high-end pillar-bedded Grayboe stock and the result is a tack-driving bullet machine that is impervious to extreme weather, rugged terrain and abusive hunts that take a toll on lesser gear. Expect the new Model 700 AWR to be as popular as its previous cousins in the 700 family have been ... and that's saying a lot. For more information about the new Remington Model 700 AWR rifle, please click here. The folks at Ruger are back with yet another version of their popular American Rifle series that has taken the industry by storm in recent years. This time, the Predator version of the rifle series is being offered in 6mm Creedmoor along with other calibers such as the 6.5 Creedmoor, .204 Ruger, .22-250 Rem., .223 Rem., .243 Win. and .308 Win. Whatever cartridge chambering you choose, expect to find the same great value and features, things that include a factory-installed one-piece aluminum scope rail; a threaded barrel with a factory-installed thread protector; a moss green synthetic stock; a one-piece, three-lug bolt system with a 70-degree throw; a cold hammer-forged barrel in matte black finish; a Ruger Marksman Adjustable Trigger (adjustable from 3 to 5 pounds); a rotary magazine; a soft-rubber buttpadd; and MOA accuracy. All in all, looks like another superb American Rifle model coming from the Ruger factory. For more information about the Ruger American Rifle Predator, please click here. Light, compact and strong, this modern sporting rifle (MSR, AR-10) from Savage Arms delivers a powerful punch for hunters in either .308 Win. or 6.5 Creedmoor chambering. With a custom forged upper/lower, the MSR 10 gives shooters a free-float M-LOK handguard, a custom-forged lower receiver; a BLACKHAWK! adjustable buttstock; a BLACKHAWK KNOXX AR Pistol Grip; and a BLACKHAWK! AR Blaze trigger. With stylish good looks and a Melonnite QPC finish, not to mention rugged reliability and superb performance downrange, this should be a proven rifle out in the field for hunters looking to move up to a MSR/AR-10 hunting platform. For more information about the new Savage MSR 10 rifle, please click here. For more information about the new T/C Compass rifle, please click here. As the number of lady shooters, hunters and gun owners has increased in recent years, Weatherby has brought out one of the industry's best rifle offerings for women. That is the new Vanguard Camilla rifle, a firearm the company says is designed for women and by women. After building the Camilla from the ground up over the last two years, the bolt-action rifle comes to market in 2017 with a short, slim forearm that reduces weight and gives a better feel. It also features a satin finish on a Turkish A-grade walnut stock with rosewood forend and grip caps, along with a high comb that provides optimal eye-to-scope alignment and faster acquisition of the downrange target. Add in features designed to augment trigger contact and control along with a balanced, compact size and feel, and the end result is an easy-handling rifle named after the first lady of Weatherby. All in all, the Weatherby Vanguard Camilla should be an inspiration to women shooters and hunters all over the country, delivering superb value, high-end performance and tack-driving accuracy. For more information about the new Weatherby Vanguard Camilla rifle, please click here. Rugged and reliable, those are both features folks at Winchester Repeating Arms say that their new XPR Hunter rifle is built upon. Taking a page from proven design features from the company's time-honored Model 70 rifle – while incorporating more efficient modern manufacturing processes – and this is a winner at the range, out in the field and not too hard on the bank account. Given the XPR Hunter's advanced polymer stock, sure-grip characteristics, a dipped Mossy Oak Break-Up Country finish and a non-reflective matte-blue finish on the barrel and the rifle is well concealed from the eyes of a white-tailed buck or bull elk, not to mention being well protected from the environment and elements. Add in a free-floating Target crown barrel, an easy-to-work bolt action, a MOA Trigger System and an Inflex Technology Recoil Pad and there is even more to like. Finish things off with a detachable-box magazine and accurate bullet delivery downrange in a number of chamberings –a .243 Win., 7mm-08 Rem., .270 Win., .30.06 Springfield, 7mm Rem. Mag. and .300 Win. Mag. among others – and this should be a popular choice of both whitetail and big game hunters. For more information about the new Winchester XPR Hunter rifle, please click here.